So far in this series, I have argued that Christians should engage the culture, beginning with understanding and apply the example of Jesus in John 1:14. Cultural engagement should take place on three dimensions: physical, relational, and spiritual. 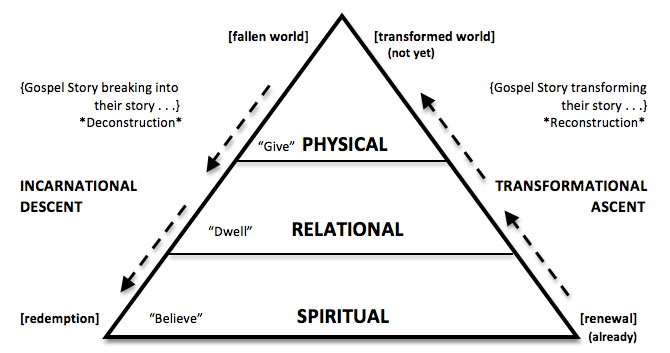 I showed how these three dimensions are best understood in the triperspectival paradigm of king/situational/physical, priest/existential/relational, and prophet/normative/spiritual. What I have not done is explain how this approach to cultural engagement is driven by the story of the gospel and works through all three dimensions. The gospel story is summarized in creation, fall, redemption, and restoration. What is instructive for us is to consider how each dimension relates to the various parts of the gospel story (i.e., how physical, relational, and spiritual dimensions are understood in creation, fall, redemption, and restoration). For a reference point, I will repost the little diagram (click to enlarge). As you can see, there is the downward movement that I call the incarnational descent. The goal is to see life transformation, which can only happen when sinners respond to the gospel. However, it is often the case that sinners see the implications of the gospel on the display in relational community (existential) and benefit from the applications of the gospel through a robust orthopraxy of good works (situational) before they discover their identity in the gospel through repentance and faith in Jesus Christ. It is only when they get to understand their identification in the gospel that transformation takes place (normative). Implications and applications are great for the plausibility and visibility of the gospel, but it is identification in he gospel that brings makes it a reality. What we discover in creation God situating His people (Adam and Eve) in His place (garden of Eden) with missional mandate to “be fruitful and multiply and fill the earth and subdue it and have dominion . . .” (Gen. 1;28). God made abundant provision for His people so that they were without physical need (cf. Gen. 1:29-31). Furthermore, God also created man in His image (Gen. 1:27) and did so in community (Father, Son, and Spirit). God did not leave man alone, but made a helper suitable for him, a partner with him he was “naked and not ashamed” (Gen. 2:25). Adam and Eve experienced relationship with God and one another prior to the Fall that was both vertically (with God) and horizontally (with one another) thoroughly enjoyable, continually enriching, and existentially profound. Spiritually, we know that God saw His handiwork in creation and saw that it was “very good.” The very creation itself is a product of his spoken word, bringing order, light, and life into the world (normative), and the fact that God rested on the seventh day indicated His satisfaction in the work He had done. When Satan sought to undo the created order, he challenged their spiritual authority but couched it in the physical realm (the forbidden fruit). The serpent tempted Adam and Eve to question what was normative (what God had spoken), with the first recorded words of Satan being, “Did God really say . . .?” (Gen. 3:1). The culture God created in the Garden was undermined at the very foundation of spiritual authority, and because Adam and Eve questioned what God declared, the sin they committed brought utter ruin and cultural devastation. The ground which freely supplied what they physically needed was now the ground cursed (Gen. 3:17-19). Their situation where they had once been placed in the center of paradise has changed, because God drove them out of the Garden. Additionally, Adam and Eve no longer experienced the relational unity and intimacy with God and one another. The first question God asks after their sin was, “Where are you?” Their relationship had been broken with God, and now they are separated from Him. But not only that, they are separated from one another, blaming one another for the sin they committed, no longer naked an unashamed but rather sowing fig leaves to cover their guilt and shame. The culture created from the Fall began with spiritual rebellion but had universal ramifications physically and relationally, and this fallen culture is what we find in our world today. To rightfully engage the culture, we must first rightfully understand the culture, and only the Bible gives you the proper lens through which to understand the world around us. There is still much to be appreciated through the imago dei and common grace of God bestowed on mankind, meaning that there are things which we can affirm and engage in. However, because of the Fall, on all levels–physical, relational, and spiritual–we experience brokenness, corruption, and ruin. We know from reading the Bible what to expect from the world around us so that we are not surprised one the one hand or brought to despair on the other. On a physical level, we engage a culture full of need, whether it is medical, nutritional, or developmental. On a relational level, we engage a culture full of broken relationships, isolation, abuse, exploitation, and self-centeredness. On a spiritual level, we engage a culture where “everyone does what is right in their own eyes”, rejecting the truth that is revealed about God, having minds darkened and hearts hardened by sin. Through an accurate diagnosis and starting point in engaging the culture, we can carefully discern what is evil (and needs to be rejected) and what is broken (and needs to be redeemed) and respond in a way that is neither naively triumphalistic or unnecessarily pessimistic. Continuing the focus on the gospel story, I will continue by picking up on redemption and restoration in the transformational ascent back through the spiritual, relational, and physical dimensions within the already/not-yet kingdom eschatology.